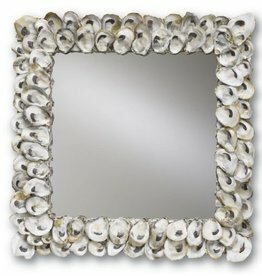 Size: 27 Dia inches.Sculpted Shells Round Mirror. Compostion: Glass, Resin. by Decorative Treasures. Size:31x2.5x79 inches. Oversized Mirror. Brushed Silver Sytle finish from with black interior border. Artmax Home Furniture and Lighting Collection.